How are you spending the first days of April.....are you taking time to create something beautiful today? How about getting started on some cheery springtime cards, and get a head start on your birthday and Easter projects. If you feel stuck and want some ideas to get you started, you are in the perfect spot! Each Wednesday we bring you completely new inspiration that allows you to jump start your creativity and inspire you to create something beautiful! Congratulations to Iona Bunny! She won a $25 shopping spree from the monthly Heartfelt Creations alumni blog hop. Instructions: Click here to view photos of the inside of this project. Book size is 6 x 6". Cut 4 pieces of white cardstock 6 x 6" and score each piece at 1/2" on the left side. Cut 7 pieces of decorative paper (1 for each side except the back) sized at 5 13/16" tall and 5 3/8" wide. Each front piece will be cut for a pocket, the front needs a slit about 1/4" from the top for the Decorative Pocket Accent die. Cut the pocket accent from white and glue to the slit in the paper. When gluing the paper to the cardstock, glue on the edges and leave the pocket open for tag. Cut tag from white and inner tag from decorative paper with a nice space for stamping a scripture sentiment. Add white corners to the bottom of tag cut using the Album Tags and Accents corner die. Use the same process on page 3. All inside pages have white corners at the bottom of the page. Page 2 and 4 have the Petite Pocket Accents, for this use the plain edge die to cut the tops and cut the narrow border from white to go over edges. Glue sides and bottom only. To decorative the front, stamp blossoms using Rose Madder, die cut and form using mold (see video above). Glue 2 layers for each bloom, pierce center and insert stamen. Stamp Cherry Blossom Retreat branches, sign and birdhouse. Stamp the Wishing Well, pail and flower pot from the Wishing Well Oasis. Use Black Memento for all and color with Copics (or favorite coloring system). The branch, flower pot, sign and pail go on the front. Pop up the pail, insert tag in pocket and then cover the back with decorative paper and draw journaling lines with blue glitter pen and a ruler. 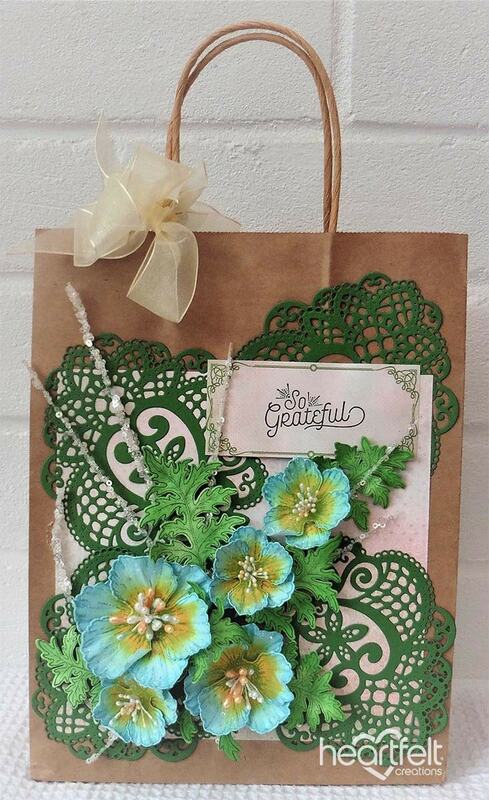 Stamp a tag from the decorative paper using Forget-Me-Not ink with using Today's Quotes and die cut with Album Tags. Page 2 front uses the wishing Well stamped previously and die cut. Glue to the bottom along with the corners. The tag is the same as page 1 tag (all the tags are alike with different scriptures on each). All the backs have lines the same as page 1. The back of page 2 along with the lines has another tag die cut from the decorative paper and stamped with Today's Quotes. Brads are added to each end of the die cut tag. Page 3 is decorated with the birdhouse and 2 birds colored with Copics and 2 white corners. The back has another decorative paper tag cut out and stamped with Today's Quotes. Page 4 is decorated with the Daydream bridge large die and white corners. Die cut the center die of Intricate Swirl Frame die set from white and stamp using Deep purple from For My Friend Stamp Set. Pop up on the large Daydream die cut. Glue 2 more birds close to the top. The back of the book is not decorated but you could add a piece of decorative paper to it if desired. Add a bit of glue to the 1/2" tabs and glue pages together well enough to keep them together while punching 6 holes through all layers. If you don't have a screw punch, then use a leather punch or piercer. See Japanese Stab Easy Book Binding (option B): https://incredibusy.com/easy-book-binding-two-ways/ for binding technique. Add a bead to each fiber end. Instructions: Cut a piece of white cardstock 11" x 6 3/4", score at 5 1/2" along the long side and fold to create a base card 5 1/2" x 6 3/4". Cut a piece of blue checked paper 5 1/4" x 6 1/2" and adhere to the front of the card base. Cut a piece of Iris cardstock 6" x 4 3/4" and stamp the bridge image from the HCPC-3869 Haven of Daydreams Stamp set in Jet Black ink. Colour in with the Zig Clean Colour Brush markers and Prismacolour pencils. Add Nuvo Pure Sheen Glitter - Diamond glitter to the image with Dries Clear glue. Adhere to the front of the card. Instructions: The ready top-fold card from white card stock measures 7" by 7?. To create the top panel, choose 6" by 6" card panel from the paper collection and glue it on a white cardstock measuring 1/16" larger on all the 4 sides. Using Cut Mat and Create 2A die, cut a window in the center. Adhere acetate sheet to create a clear window. Stamp the sentiment with blue ink on the back panel of the clear window. Layer the panel on blue cardstock measuring 6 1/2" by 6 1/2". Layer the complete panel on the card base. Stamp the florals from Tweet Cherry Blossoms Cling Stamp Set with Magenta Hue on Deluxe Flower Shaping Paper and color them using Tea Rose and Magenta Hue and cut them using coordinating dies. Shape them using Cherry Blossom Shaping Mold. Press the centers and glue them to form 2 layered flowers. Add mini pearls to the flower centers to complete the flowers. Also, stamp the Cherry Blossom leaves and leafy vines from Classic Rose Collection. Color them using Leaf Green and Olive Green and shape them using their coordinating molds. Once all the elements are ready, assemble the card as shown and finish the card by adding Rajni Chawla's Crystal clear glitter to the flowers and leaves using an adhesive that dries clear. Also, add die cut birds from the paper collection for extra interest. Instructions: Cut card base 5.5 x 5.5 inches in white card stock. Stamp the wishing well from the Wishing Well Oasis Cling Stamp Set in Jet Black on mixed media paper and color with Copic markers. 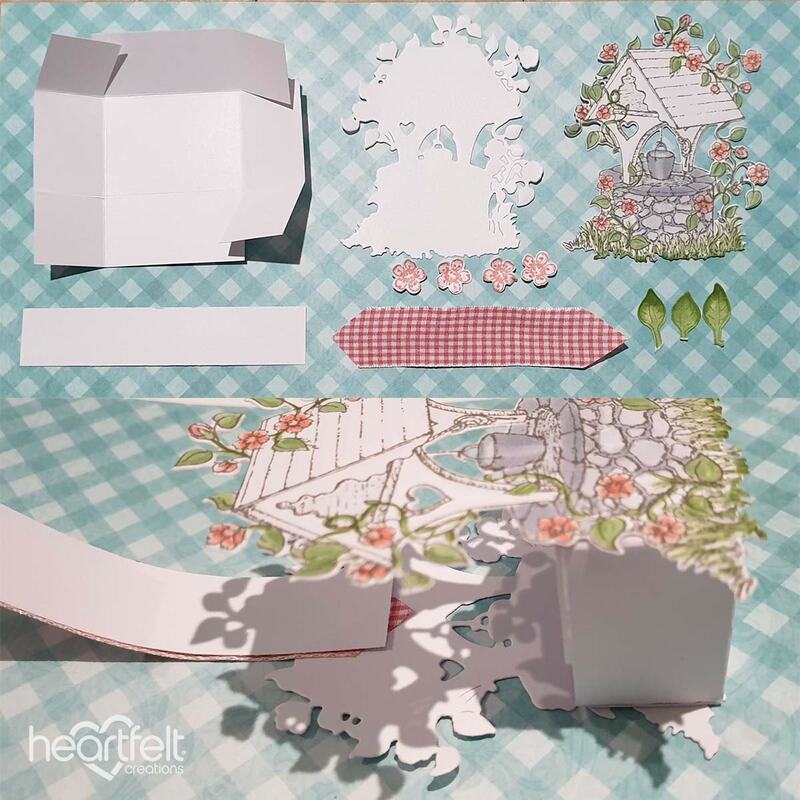 Cut a scenery square piece of designer paper from the Cherry Blossom Retreat Paper Collection the size of the card base, cut an oval to the right of the flowers on the designer paper and a smaller oval in black for a mat. Adhere the card front with foam tape over the wishing well. Stamp the fence from the Tulip Cart & Fence Cling Stamp Set and the sign from the Cherry Blossom Retreat Cling Stamp Set in Black and sponge lightly with Jet Black, cut out with corresponding dies. Cut out the corner die from the Elegant Pocket Accents Die in black cardstock and adhere to the left top corner with foam tape. Stamp the flowers from the Tweet Cherry Blossoms Cling Stamp Set in Lilac Posies, sponge with same and centers with Bamboo Leaves and cut out with corresponding dies and sculpt with the 3D Cherry Blossom Shaping Mold. Sponge blossoms with adhesive and cover with Crystal Clear. Adhere sign and fence with foam tape for dimension and the flowers around the window, as shown. Instructions: My card size is 4 1/4 x 5 1/2". 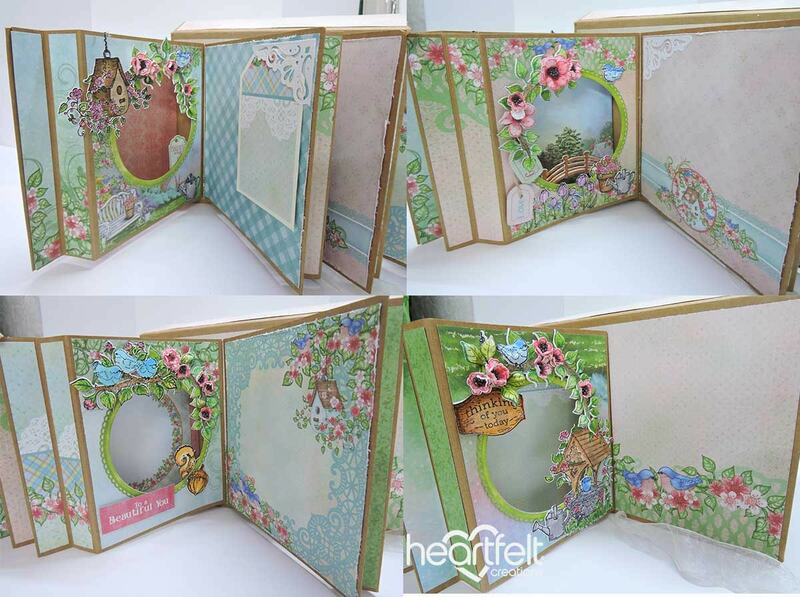 Make card base and cover it with a piece of the paper collection. Using white cardstock cut out the Lacy Diamond Die. Cut a coordinating piece of cardstock to fit the center of the diamond and glue it to the back. Glue this piece down onto the card front. Stamp the limb onto white cardstock using Jet Black Archival Ink. Use the Dove Blender Pen and ink to color this piece. Glue to the center of the diamond medallion and set the card aside. 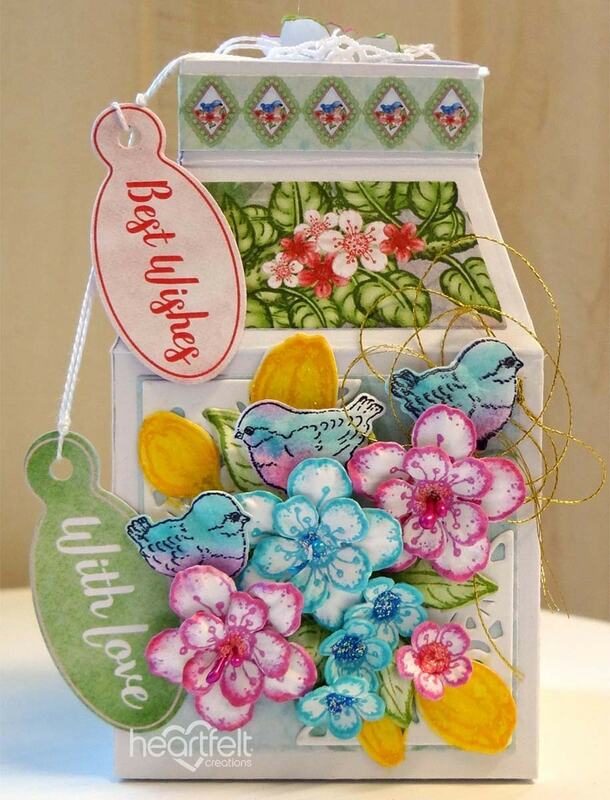 Stamp, color and cut out the flower petals, leaves and little birds using coordinating stamps and dies. I used Magenta Hue Archival ink to stamp the flower petals. I stamped the little birds using Jet Black Archival Ink and then colored with ink and the Dove Blender Pen. When I did the bellies of the little birds I used the fantastix and the Magenta Hue ink to color. Layer the birds, leaves and flower petals into the mold, spritz with water and run through the Vagabond 2 then lay aside to dry. When dry layer the flower petals and add the Prills to the centers. Add glitter and set aside to dry. Glitter the little birds and set aside to dry. Once everything is dry, decide on the placement and glue to card front. Find a sentiment on the paper collection and cut out. Layer with dimensional tape and adhere to card front. Glue a leaf and a little bird to the corner of the sentiment and the card is finished. Other Products: Versafine Smokey Gray, Gingham Ribbon, Stickles Diamond, White cardstock, Glossy Accents, Copic R20, R22, G21, G24, C00, C1, C2, C3, E33. Instructions: Click here to see how to put this project together. Using your Rouge ink stamp your small Cherry Blossoms, as it is pigment ink heat set or set aside to dry before cutting with coordinating die. Stamp your leaves using Bamboo Leaves ink and color with the same ink, cut with coordinating die. Highlight with same ink. Lightly mist with water and shape in your 3D Cherry Blossom Shaping Mold. Stamp your wishing well using Versafine Smokey Gray ink. Die cut with coordinating Die. Die cut 1 outline with the same die. Color your stamped image using copic or markers or pencils of choice. Cherry Blossoms R20, R22. Leaves G21, G24. Highlight Roof C00. Well and bucket combination of C00, C1, C2, C3. Rope E33. Adhere 2 Cherry Blossoms and leaves to the top and 2 to the bottom. Decorate with stickles as desired. Highlight the stones and the water and the water inside the bucket with glossy accents. Tie a white bow and use a thin strip of the gingham ribbon to tie around the center section of your bow. Adhere to the top of your handle. Hope you enjoyed my project. For more tips on creating with the Sweet Peony collection, watch the tutorial at: https://youtu.be/L9_MLkvpGPQ. For more tips creating with the pocket dies, watch the tutorial at: https://youtu.be/uDhKUj9AAMo. Instructions: Finished card size is 6" x 6". Cut base of card from white cardstock measuring 6" x 10 1/2", score at the 4 1/2" mark. Place border die on edge of cardstock and cut, making sure to only cut about half of the border, this will create the decorative edge for the front of your card. Cut a piece of patterned paper for front of card with border die, cut edge to match cardstock, trim straight edges, ink edges with distress ink and glue to front of card. Cut a white decorative border from the Elegant Pocket Accents, glue to card as pictured. Cut a scalloped border from white cardstock and glue as pictured. Cut a 6" x 6" panel from patterned paper, ink edges with distress ink. Stamp sentiment as pictured, glue to inside of card. Cut a decorative corner from white cardstock, glue as pictured. Stamp all flowers and leaves on deluxe flower shaping paper, Tweet Cherry Blossoms - chrome yellow, Sweet Peony-Rouge and broken china, leaves-mowed lawn, cut with coordinating dies. Color flowers and leaves with same colors used to stamp the images. Shape the pink and blue flowers using the flower shaping kit and the golf tool set. Shape the yellow flowers with the cherry blossom shaping mold. Shape the leaves with the leafy accents shaping mold. Layer several flowers together and glue, for the smaller flowers keep one layer each. Add stamen to center of flowers. Glue leaves and flowers to card as pictured, because of the stamens in the flowers it is easier to use a hot glue gun to glue all your flowers to your card. Add glitter to flowers and background image for a little sparkle. Instructions: Click here to view a larger photo of this project. Die cut 4 box dies from the HCD1-7163 A Gift of Love Box set out of white card stock. Use the solid panel die and cut 4 from design paper. Adhere to panels of box. Die cut 4 of the small upper accent panel die from design paper and adhere to box. Die cut 4 corners from the Album Tags and Accents Die from white card stock. Adhere 2 to the front, opposite corners and 2 to the back, opposite corners. Stamp flowers, birds, leaves on Deluxe Flower Shaping paper, pink flowers with Magenta Hue, blue flowers with Aquamarine, green leaves with Bamboo Leaves, yellow tulips with Cantaloupe. Sponge edges of flowers with same inks with sponge daubers. Color tulips with pencils. Stamp birds with Jet Black. Sponge with Magenta Hue and Aquamarine. Die cut everything with coordinating dies and shape with 3D Shaping Mold. Add stamens to center of flowers. Add to front of box as shown with hot glue and Dries Clear Glue, using gold thread under 1 bird. Assemble box. Cut out 1 border stripe and add to top of box. Add lace doily to top of box. Add leaf and flower with hot glue. Die cut tags with coordinating die. Tie with embroidery thread and then adhere to side of box with glue dots. Add Stickles to center of small flowers and on tulips. Other Products: Ribbon, 3D Foam Tape, Pencil Colors, Twine, Double Sided tape. Instructions: Click here to view more pages of this album. The Finished album measures 9-1/2 x 6-1/2". For the cover of the album - Cut two pieces of chipboard 9-1/2 x 6-1/2" for the front and back cover. Cut one piece of chipboard 9 -1/2 x 1-1/2 for the spine. Join two pieces of Kraft Cardstock overlapping 1/2 inch portion with double sided tape and cover the chipboard pieces with Kraft Cardstock keeping 1 inch space on all the four sides for covering the sides. Make sure to keep a space of 1/4 inch between front cover, spine and back cover for easy folding of album. Mat the inside and outside of the album with pattern paper from the paper collection. For the closure of the album use ribbon. Die cut white cardstock using the Eyelet Lace Frames Die. Stamp the inside of the die cut with a sentiment from the Just For you Sentiments Cling Stamp Set. Distress the die cut outs with Color box ink - Concord. Arrange them in the center of the front cover as shown. The inside of the album consists of four popup pages measuring 6 x 6". To create popup page, cut one piece of Kraft Cardstock 7 x 6". Score one piece at 1 inch from the 7 inch side, this will form the base of the page. Next cut kraft cardstock 8 x 6", score at 1, 5 and 1 inch and apply double sided tape on both the 1 inch spaces. Mat the kraft cardstock with pattern paper first and then die cut 5 inch space using the second largest die from the Eyelet Circle & Basics Small Die set to create the window for the picture. Frame the circle with Eyelet Circle die cut. Attach the popup front panel to the base page by adhering 1-inch space. Stamp white cardstock with the wishing well, watering can and flower pot images from Wishing Well Oasis Cling Stamp Set using Archival ink - Jet Black. Also stamp White Cardstock with the bird house and banner image from the Cherry Blossom Retreat Cling Stamp Set using Archival Ink - Jet Black. Stamp white cardstock using the bridge image from the Haven of Daydreams Cling Stamp Set using Archival ink Sepia. For the flowers, stamp white cardstock with Tweet Cherry Blossoms Cling Stamp Set using Archival Ink - Carnation Red. For stamping the leaves use Archival ink Library Green, die cut the images with coordinating dies. Color the flower petals with Archival ink - Carnation Red and Leaves with Archival Ink Fern green and Leaf Green. Shape the flowers and leaves using the 3D Cherry Blossom Shaping Mold. Stamp white cardstock with the leaf branches from the Cherry Blossom Retreat Cling Stamp Set using Archival Ink - Library Green. Die cut with coordinating die and color the images with Pencil Colors. Once all the elements are ready arrange them as shown. Apply Crystal Clear glitter on flowers with clear drying glue. Once all the images and flowers are ready arrange them as shown. Other Products: Canson watercolor cardstock,Crafter's Companion Regency Swirls 3D Embossing Folder and paint brush. Instructions: Take a 4 1/4" x 5 3/4" piece of black cardstock and emboss it using Crafter's Companion Regency Swirls 3D Embossing Folder. Adhere it to a 4 1/2" x 6" black top folding card base. Take 2 pieces of black cardstock and die cut 1 using the dies from Elegant Pocket Accents Die and another one using the die from Album Tags and Accents Die. Position them as shown and adhere them together. Adhere this piece to the card base using Darice Adhesive Foam Strips. Stamp the image from Burst of Spring Cling Stamp Set on a piece of watercolor cardstock using Jet Black Archival Ink and color it using Zig Clean Color Real Brush Markers and a paint brush. Die cut the image using the matching die from Burst of Spring Die. Adhere it to the card base as shown using Darice Adhesive Foam Strips. Add black rhinestones to the die cut for the finishing touch. Instructions: Create a 6 x 6" card base using white paper. Cut a piece of paper from the Cherry Blossom Retreat Paper Collection 5 3/4 " x 5 3/4 " and adhere to the card base using Dries Clear Adhesive. Cut out swirl die from Daydreams Bridge Die from paper collection and using Darice Adhesive Foam Strips, place on the middle of card. To create flowers, Stamp Tweet Cherry Blossoms Cling Stamp Set on Flower Shaping Paper with StazOn Ink Pad - Black Cherry and cut using the coordinating dies. Color with StazOn Ink Pad - Black Cherry and Ranger Archival Ink Pad - Leaf Green (use daubers). Place the flowers in the Cherry Blossom Shaping Mold and spritz with water. Run through diecutting machine. Allow to dry. Using a paint brush, paint ready flower with Designer Dries Clear Adhesive and sprinkle with Rajni Chawla's Crystal Clear Glitter. Stamp twigs and leaves from Cherry Blossom Retreat Cling Stamp Set on the white paper with Ranger Archival Ink Pad - Leaf Green, cut out with the coordinating die, shade with this same ink using Daubers. Stamp birds from Tweet Cherry Blossoms Cling Stamp Set using Ranger Archival Ink Pad - Sepia on the white paper and cut out with the coordinating die, shade with Ranger Archival Ink Pad - Sepia. Using sponges, tap ready elements with Designer Dries Clear Adhesive and sprinkle Rajni Chawla's Crystal Clear Glitter. Arrange flowers and leaves as shown using hot glue gun. White cardstockor more tips on creating with the Cherry Blossom Retreat collection, watch the tutorial at https://youtu.be/OaA2da5H-E0. Instructions: Cut a piece of white cardstock 10" x 7", score at 5" along the long side and fold to create a base card 5" x 7". Cut a piece of blue checked paper 7" x 5" and adhere to the front of the card. Die cut the frame from the HCD1-7191 Intricate Swirls Frame die set in the Honeydew cardstock and adhere to the front of the card. Cut a 6" x 5" panel from the paper collection and adhere to the top of the frame. Die cut the eyelet heart using the second largest eyelet heart die out of the Honeydew cardstock. Die cut the inner die from the blue checked paper using the second largest plain die and adhere to the eyelet heart and then to the front of the card as shown. Stamp the wishing well image from the HCPC-3866 Tweet Cherry Blossoms Stamp set in Jet Black ink on Iris cardstock. Colour with Zig Clean Colour Brush Markers and die cut with the coordinating die. Adhere over the heart. Stamp the leaves from the HCPC-3866 Tweet Cherry Blossoms Stamp set in Library Green ink on Iris cardstock. Colour with Leaf Green and Olive inks and die cut with the coordinating die. Shape using the coordinating mold and add Crystal Clear glitter to the leaves with Dries Clear glue on a damp sponge. Add over the branch and add two leaves to the base of the decorative die as shown. Stamp the flower images from the HCPC-3866 Tweet Cherry Blossoms Stamp set in Carnation Red ink on Iris cardstock. Colour some images with Carnation Red and some with Pink Peony inks. Die cut with the coordinating dies. Colour the back of the flowers with Pink Peony ink and shape using the coordinating mold. When dry add Crystal Clear glitter using Dries Clear glue on a damp sponge. Add Coral Seas Prills to the centres and then add to the branch and to the birdhouse and to the base of the decorative die over the leaves. Stamp the bird images from the HCPC-3866 Tweet Cherry Blossoms Stamp set in Jet Black ink on Iris cardstock. Colour with Zig Clean Colour Brush markers and die cut with the coordinating die. Shape using the coordinating mold and then adhere above the flowers at the top of the card as shown. Instructions: Prepare a 5 x 7" white card base. Round the corners of the upper right side and the lower left side. Cut a piece of the Tulip Time paper 1/4 inch smaller and round the same 2 corners, add foam to the back and adhere to card. Die cut one white Lacy Diamond and add foam dots to the back, adhere to the center of the card. Stamp the 2 of the Leafy Accents on the Deluxe Flower Shaping paper and a few from the Oakberry Lane set with the Emerald Green ink, color in with the Vivid Chartreuse and cut out with the coordinating die, ink the edges with the Leaf Green, place in the matching molds and run through the diecutting machine, adhere one on the upper left and the other on the lower center as shown. Stamp the Oakberry Lane flowers on the Deluxe Flower Shaping paper with the Majestic Violet ink, color the centers with the Sunflower ink, cut out with the coordinating die, ink the edges with the Majestic Violet ink, place in the Oakberry Lane flower mold, run through the machine and adhere to the card on top of the leaves. Add the remaining leaves here and there to fill in the empty spots. To finish the card, add glitter to all the leaves and flowers. 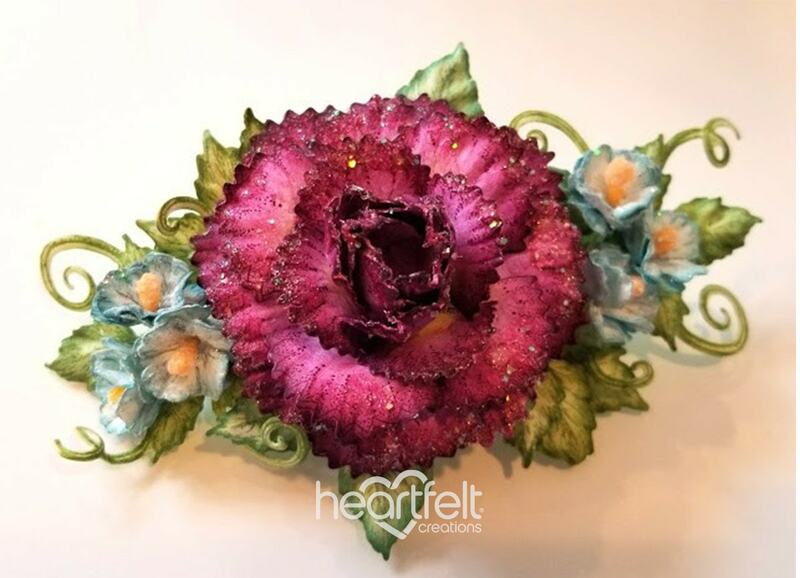 Add the micro beads to the center of the flowers. Instructions: The jewelry set contains a neckpiece and a hair comb. These have been decorated with roses and tulips. Stamp the Roses and tulip buds on Deluxe Flower Shaping paper with a combination of Plum and Vibrant Fuschia inks. Stamp a few leaves with Library Green ink. Colour using the sponge daubers with same inks. Cut with Coordinating dies and shape in the flower shaping molds. Give more depth and embossing to the flowers using the Groove Golf tools. Apply a coat of Glossy Accents to the flowers and leaves and add glitter powder. Let it dry. Arrange the flowers and leaves on the jewelry base with glossy accents and let it dry overnight. Apply a thin coat of glossy accents on leaves and some flowers and add the micro beads. Let it dry. The jewelry is now ready to use. Flaunt it in front of friends or gift to your loved ones. Instructions: Click here to view a larger photo of this project. Make the flowers: Stamp the poppies onto deluxe flower shaping paper using balmy blue ink. Colour the centre using bright sunshine and add the summer sky ink the to outer edge of the petals. Die cut the flowers and colour the reverse of the petals with summer sky. Spritz the reverse of the poppies with water and use the flower shaping tools and grove golf tools to shape the flowers, allow to thoroughly dry. Poke a hole through the centre of the flowers and thread through stamens, secure in place with hot glue. Brush dries clear glue to the ends of petals and cover with crystal clear, remove excess and allow to dry. Make the leaves: Stamp the daisy leaves onto the deluxe flower shaping paper using early espresso ink. Colour with Basil leaf blending ink and die cut. Colour the reverse of the leaves with basil leaf ink and spritz lightly with water. Shape using the flower shaping tools. Allow to thoroughly dry. Die cut 4 of the large Daydreams Bridge die using garden green card stock and adhere one to the bag to the top right. Cut a 6.75" square piece of paper from the paper collection and adhere to the bag. Position the remaining 3 Daydreams Bridge die cuts onto the bag and glue into place. Cut a label from the paper collection and stamp the sentiment onto it using black ink, hot glue into position at the top of the bag. Snip approximately 5 pieces of sequined sticks and position with a little hot glue. Snip the excess stamen wires off the flowers and glue into position along with the leaves. Tie 2 bows to the handle of the bags and secure with a small amount of hot glue. Instructions: Click here to view a larger photo of this project. Cut two ovals from felt with the appropriate size of oval from the Eyelet Oval & Basics Die, adhere them together for thickness as a base for the corsage. Adhere the pin to the oval with hot glue. Stamp the Camelia Carnation from the Large Camelia Carnation Cling Stamp Set in Plum, sponge with same. Stamp small roses from the Classic Rose Cling Stamp Set in French Ultramarine and sponge with same, cut out all with corresponding dies and sculpt with the 3D Floral Basics Shaping Mold. Add bead stamens to centers of small flowers, sponge blossoms with adhesive and cover with Crystal Clear. Stamp, and sponge leaves from the Leafy Accents Cling Stamp Set in Bamboo Leaves, cut out with corresponding dies, sculpt with the 3D Leafy Accents Shaping Mold. Adhere leaves and flowers on felt oval as shown. Spray with acrylic sealer. Instructions: Card size: 4 7/8 x 6 7/8". Cut a gold panel to fit card and an Ivory panel 1/8" smaller all the way around, then glue them to the card base. Cut an Ivory and a gold Eyelet Lace Frame and off set them slightly when gluing them together. Glue the gold and Ivory stacked frame to the card. Tie gold ribbon around left side of the card or tuck ends under the gold panel before gluing it to the card base. Cut 3 sizes of Diamond Basics out of Ivory and cut 3 matting eyelet diamonds out of gold, cut 3 out of foam sheet with the diamond basics. Before gluing the smallest diamond on to its gold mat, stamp and emboss the sentiment in the center. Glue each diamond set (gold eyelet and ivory basics) together with its foam die. cut and glue to the card. Stamp and die cut the Oakberry Lane Blossoms out of ivory using gold ink. Form in the Shaping Mold. Stamp, die cut and form leaves out of ivory as well. Pierce the centers of each blossom and insert stamen, small ivory pearl and medium gold beaded. Arrange flowers and leaves around left side of the diamonds and add a gold bow to the bottom left. Instructions: Ready box measures 8" x 5" x 1". To create box, first take a piece of smooth white cardstock measuring 15" x 12". Score at 0.75", 1.75", 2.5" and 3.5" from all four sides and create a box. Adhere the pieces of designer paper to cover the box and distress all the edges using deep purple archival. Cut four corner die cuts from white cardstock and glue as shown. To create slide cover, take a piece of white cardstock measuring 8" x 12.5". Score at 2.5", 3.5", 8.5" and 9.5". Fold the score lines and glue the edges. Cut two pieces measures 8"x 5" and two pieces measures 1"x8" from the designer paper collection. Distress all the pieces using deep purple archival and adhere to the cover. Choose another designer paper and cut a piece measuring 7.5" x 4.5". Mat it on the white cardstock which is cut 1/8 of an inch larger on all four sides. Mat it on the cover using dimensional tape. To decorate the cover, cut an oval die cut from white cardstock using Eyelet Oval & Basics Small die. Cut one piece from designer paper collection using second largest die. Cut white cardstock using day dreams bridge die. Cut the die cut in half and glue it on one side of the cover. Matt oval die cuts using dimensional tape as shown. Cut an arrow using arrows and banner die from white cardstock. Stamp sentiment on Arrow using black archival. Tie a satin cord on one end of the arrow. Glue it as shown. Stamp cherry blossom retreat flower on vellum paper using versa mark and heat emboss with white embossing powder. Cut with coordinating die. Paint the flowers using distress oxide. Add rock candy stamens in the center of the flower. Stamp two classic rose leaves and one cherry blossom leaves using library green archival and cut with coordinating die. Paint the leaves using fern green archival and library green archival. Slightly shape the leaves. Arrange flowers and leaves on the cover as shown. For more tips on creating with the Flowering Dogwood collection, watch the tutorial at https://youtu.be/gI8RqHAt3vE. 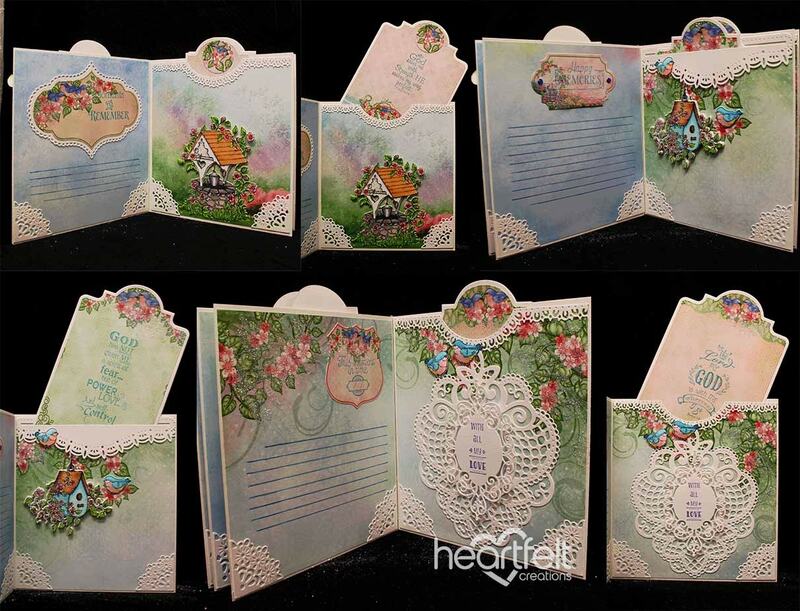 Instructions: This card tutorial is to show just how much you can do with the beautiful Heartfelt Creations paper pads. Cut the light pink patterned paper to 6x6 and adhere to the white cardstock base. Find the patterned 6x6 panel with the white lacy frame. Fussy cut around the outside of this frame. Adhere to the card using crafty foam tape. Using the eyelet circle die and another smaller circle die, cut a ring from white cardstock. Adhere to the middle of the card using 3D foam squares. Find and die cut out the circle image with the Flowering Dogwood branches. Adhere to the middle of the card using 3D foam squares. Find and cut out the "Sending You Easter Wishes" sentiment. Adhere to the card using 3D foam squares. Add Liquid Pearls (Opal) dots along the ends of the sentiment. Add Stickles (Lime) to the middle of each of the Dogwood flowers. Add gems to the middle lacy frame sections. Instructions: Cut out 3 pieces of white cardstock, two at 9 x 5 1/2" and one at 7 x 5 1/2". Take one piece of the 9 x 5 1/2" and score this at 2" on both short sides. Then put Scor-tape on those flaps on the back side of the paper. Take a piece of the patterned paper and cut it at 5 1/4 x 4 3/4", glue this in the center in between the score lines, fold the flaps up. Cut a person out of the photo and place him on the fence. Now take the small piece of 7" and score it at 1" on both short sides. Take the 5th rectangle die and center it on that card then run it through your diecutting machine. Take the flowers and greenery you made and place them behind this opening and a piece of a photo if you like, then fold the flaps to the back, put Scor-tape on them and place them in the score lines from the first long piece you just made and tape them down. Take the 2nd big piece and score 2" on each short side, take the 6th rectangle from the set and center this on the piece and run it through the machine. Fold the flaps to the back and place this on top of the other 2 then tape it down. Get the rest of your greenery and flowers and decorate the front - you can also use a part of a photo. Cut also a piece of the design paper out with the flower border on it and glue this on the front! Flowers: Stamp the flowers and leaves of all the sets I mentioned with Bamboo Leaves ink and color the green with Leaf Green and the flowers with Buttercup and Vibrant Fuchsia. Die cut all the flowers with the coordinating dies. For the hyacinth shaped flower, you dab some glue on it and then you put some prills on top and let it dry. Stamp 1 small peony flower with Vibrant Fuchsia ink and die cut, color the center with Buttercup and the ends of the flower with the Vibrant Fuchsia ink, shape it on your Deluxe Flower Shaping kit. Make a hole in the center and place the stamens in it. Stamp some small flowers from the Fashionista set color them very lightly with Vibrant Fuchsia ink, die cut and shape them on your mat, place some crystals in the tiny flowers. Instructions: Card size is 6 x 6". Cut cardstock to 12 x 6", score on the long side at 6" and fold to create card base and round corners. Cut paper from the Patchwork Daisy Paper Collection to 5 7/8 x 5 7/8", round the corners, ink the edges with Forget-Me-Not ink and adhere to the inside of the card. Cut white cardstock to 5 7/8 x 5 7/8", round corners, place in rose embossing folder, run through diecuting machine and adhere to card base using dries clear adhesive. Cut white cardstock to 5 x 5 3/4" and diecut both edges using the Regal Borders and Pockets Die. Sponge both edges with dries clear and sprinkle with Rajni Chawla's Crystal Clear glitter. Using the edge die from Regal Borders and Pockets Die, cut white cardstock 2 3/4 x 5 3/4", place in rose embossing folder, run through diecuting machine and adhere to decorative Regal Border diecut using dimensional tape. Adhere Regal Border Decorative die to card base using dimensional tape. Stamp the classic rose on Deluxe Flower Shaping Paper using Forget-Me-Not ink, color using Vivid Chartreuse and Forget-Me-Not inks, diecut using the coordinating die and shape using the Rose shaping mold. Finish shaping using the Deluxe Flower Shaping Kit. Layer petals together to create roses. See video above. Sponge with dries clear adhesive and sprinkle with Rajni Chawla's Crystal Clear Glitter. Stamp the leafy accents stamps on Deluxe Flower Shaping Paper using archival olive green, color using olive, leaf green and Cactus Flower Inks, diecut using the coordinating die, place in the Leafy Accents Mold, sprinkle with water and run through the die cutting machine. When dry sponge with dries clear adhesive and sprinkle with Rajni Chawla's Crystal Clear. Instructions: To create card, score your cardstock to 5 x 7" and set aside. Now take your ornate pocket die and diecut on the gold mirror paper. Next, you will take the same die align next to the first cut and diecut, this allows you to form a perfect cut piece. Stamp a total of 10 blossoms stamping with the Blazing Red ink. You will now take your dauber and sponge more ink in the flowers centers as well as on the edges of the blossoms to give you more depth. Pierce your flower centers and add your stamens to the centers using the glue gun. This gives you a very strong hold. Now apply some glitter glue which allows the color to shine through. Stamp and diecut your leaves on the green cardstock using Eden Green Stazon ink. Shape by placing in the coordinating shaping mold. Apply a spritz of water to allow the material to be more pliable which will give it more shape. You can apply additional shape by molding using your embossing tool and add to the flower arrangements. Add a touch of glitter. Take your Black Memento ink and stamp your sentiment on paper cut from the paper collection. Assemble your card as pictured once all the elements are complete. What do you like about what you saw? I just love Linda's Garden! I am looking for ideas on making cards inside picture frames and this one gives me an idea for Christmas presents. Thank you for the picture and instructions. Projects by Anita and Olga are really drawing my attention this week! Thanks for all these beautiful inspirations!! These are all so stunning that it would be hard to pick a favorite. The "Floral Nosegay" is gorgeous, and I'm always looking for way to make a kleenex box look good. Every one of the projects are beautiful. Wow! A great line-up of inspiration from the DT. I especially like Nupur's striking piece with those bold florals against that elegant black background!